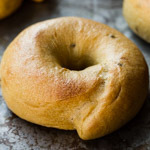 I used white (hulled) sesame seeds, which lend a delicate sesame flavor and are not visually prominent in the bread, just because I had some on hand that needed to be used up. 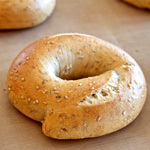 Regular sesame seeds, and toasted if you like, would also be lovely. You could also leave them out altogether. We’re nothing if not flexible. 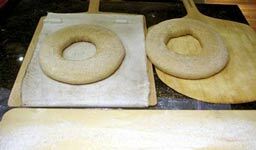 These crowns can be shaped in authentic or makeshift couronne baskets, or simply on a floured board, which is what I did here. If you make two crowns but do not have two peels to load them into the oven, make sure you proof them on separate boards because you need to flip the crown off the board and onto the peel. I placed mine on a single large board and tried — nearly successfully — to flip them onto my two peels simultaneously. 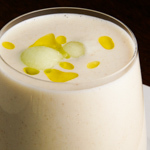 To mix the sponge and poolish, mix each of their ingredients, respectively, until just combined. Cover and ferment overnight (8 – 12 hours) at room temperature. In the bowl of a stand mixer with dough hook, combine all of the final dough ingredients except the sesame seeds. Mix on low speed until just combined, about 4 – 5 minutes. Adjust the water as needed to achieve a medium dough consistency. Add the sesame seeds and mix on low speed just until they are evenly incorporated into the dough. 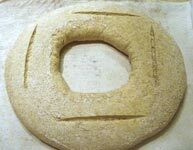 Turn the dough into a lightly floured counter and divide it into two pieces. Preshape each into a light ball and let rest, covered, for 15 minutes. To form the crown shape, pierce the ball in the center with your elbow, then pick the dough up and gently turn and stretch it evenly until the strand is about 2.5 inches in diameter. 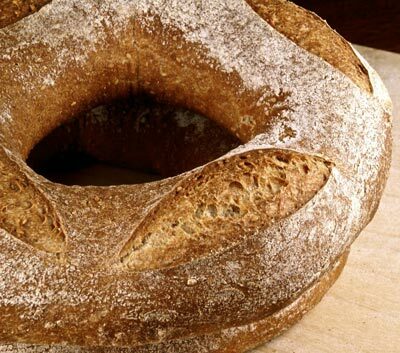 Place the shaped crowns upside-down on a board that has been liberally dusted with whole wheat flour. Proof at room temperature, covered, for about 1 hour and 15 minutes. Once the bread is in the oven, reduce the temperature to 450F. Bake for 10 minutes with steam, and another 25 minutes or so without steam. The crust should be a dark golden brown. Then turn off the oven and leave the loaf in for another 10 minutes, with the door ajar. Those breads look so beautiful! Like out of a bakery! Your couronnes are magnifique! I am having a bit of difficulty translating the flour names though, whole wheat or whole meal is only used in the uk when you use the whole of the grain in the flour. White flours all have bran and wheatgerm removed. 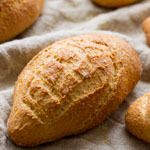 my best guess for uk terms is: regular = plain flour (low protein level) whole wheat flour (wholemeal, brown with all the bran and wheatgerm included) white whole wheat (strong white bread flour, high protein level ) and semolina translates ok. This looks really good. And I have some semolina flour which I haven’t used for ages. Perfect, thanks for the recipe! Das sieht hervorragend aus. Mit Hartweizengrieß habe ich bis her noch nicht gebacken. Werde es jetzt aber tun. They are so beautiful and rustic! I am proud to have a real lame now, can’t wait to score some rustic loaves! 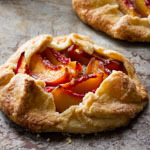 I’m with Rosa on this – these look as good as if not better than what I see at our boulangerie! Fabulous! As ever! 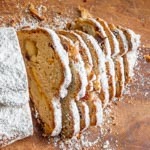 I’d love to have a few slices – this is perfect to go under some cheddar or comté! Beautiful and prefect! 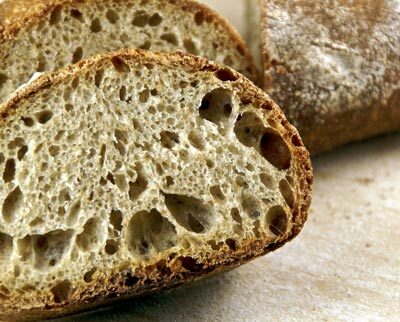 Love wheaty bread, if only the crumb look as beautiful as yours. More delicious and beautiful creations!! These breads do look perfect for toasting with honey and butter..but wait…mmm for lunch with a hearty soup. And as always, your photos are so professional! I’m always so amazed by what you bake. Those loaves are just gorgeous with a beautiful crumb! I love wheaty bread. I’ll have to try these! Wheaty seems to discribe the bread very good for me. Love the idea of using diffrent kinds of wheat! It has such a nice open crumb! It is already added to my toDo List, I just have to think about an alternativ for white wheat, which is not available in germany (untill now, I hope it will change soon). Those are beautiful – perfection even. I love reading your posts about bread making because I learn so much. Now I have to put some of the knowledge into practice. 🙂 Looking forward to the next post. Thanks! These look magnificent!! The crumb looks amazing. Just stupendous, especially for whole wheat. 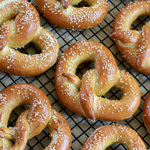 I want to make this, but do you suppose the semolina flour could be swapped out for more whole wheat? I’m not sure that I can find that locally. . .
Great-looking crust and lovely shape! I like the alternate slashes. 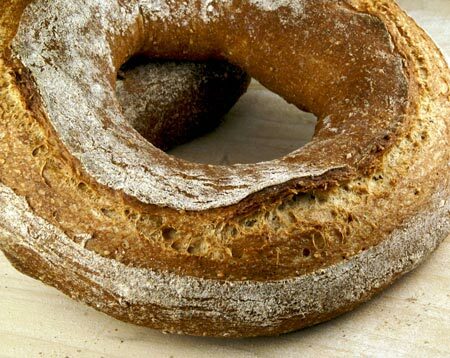 Jo, white whole wheat is a whole grain flour milled from a certain variety of wheat — white wheat. 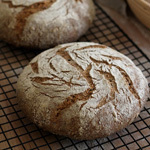 It has a bran that is lighter in color and less bitter in flavor that the traditional red wheat. I’m not sure if it is available in the UK. Stefanie, if you don’t have white whole wheat just use red whole wheat flour. 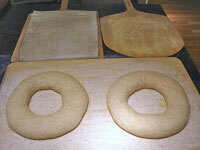 The color of the bread will be darker and the flavor will be a bit stronger. Laura, if you can’t find semolina, I’d substitute white flour for it. 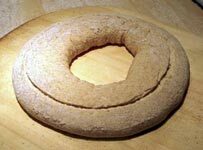 You could use whole wheat too, but you’d need a little more water and you’d get a denser bread. Your recipe here inspired me to try using 2 different preferments as well, instead of the sponge I used a starter from a pure rye sourdough and a poolish as you did. I was amazed by the superb leavening I got from that combination, the first time I overproofed the loaves as they rose a lot quicker than I’m used to when using pure sourdough starters, but today I shortened the proofing and got my best looking loaves ever! Really nice large holes throughout. I often have a problem with large holes just below the upper crust and then a denser crumb at the bottom, but this method resulted in an even crumb. Thanks for the nice tips! yum! that bread looks gorgeous! i love using semolina. the first time i used it in my pizza dough recipe, i never went back. i’m going to try this recipe this weekend. thanks for sharing! I baked the bread now, and it turn out great! The crumb is not as open as yours, it is more even. I think that is due to replacing the white wheat flour with red wheat flour! But the taste is so good. Lovely loaves, as usual, Susan. The slashing is beautiful. And I love the idea of creating the ring shape by using my elbow to start the hole! Really lovely, how bout sourdoughing it?? I love this blog and this is one of my favorite entries. The crown shape itself really adds to the delight of this bread. 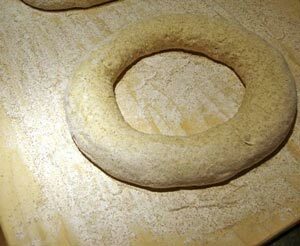 I make the ring shaped bread, the Neapolitans call it ciambella. I proof them separately on floured 100% cotton bandanas. I learned this from my grandmother. You can slide a “chilled” metal cookie sheet under the bandana to help flip it onto the peel. They are also called tortano and can be filled and baked. Slide the “chilled cookie sheet” under the dough for the last 5 minutes before baking, it will be easier to score a high hydration loaf because the top of the dough will firm up .